427 Beacon is located on the south side of Beacon, between Gloucester and Hereford, with 425 Beacon to the east and 429 Beacon to the west. 427 Beacon was built ca. 1869, one of eight contiguous houses (419-421-423-425-427-429-431-433 Beacon). The houses were designed as four matching symmetrical pairs (419-421 Beacon, 423-425 Beacon, and 427-429 Beacon, and 431-433 Beacon). 433 Beacon was remodeled in about 1897 and the entrance moved to 12 Hereford. Click here for an index to the deeds for 427 Beacon. After the houses at 427-429 Beacon were completed, Frederic and Caroline Sawyer sold 429 Beacon and made 427 Beacon their home. They previously had lived at 68 Pinckney. 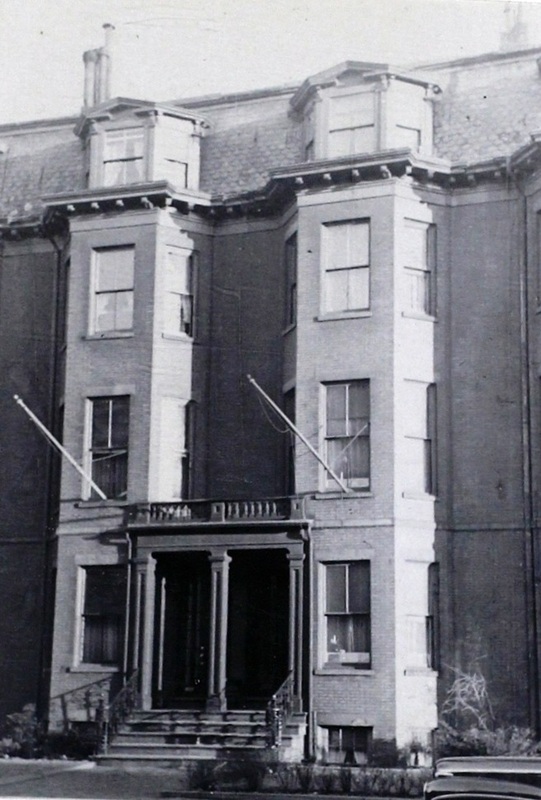 The Sawyers continued to live at 427 Beacon in 1871, but had moved to 25 Cambridge by 1872 and to the Clarendon House hotel at 523 Tremont by 1873. 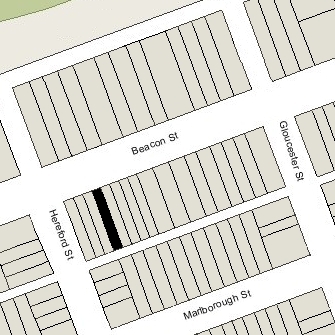 By 1874, they were living at 433 Beacon (12 Hereford). By 1872 , 427 Beacon was the home of Cadwallader Curry, proprietor of the National Bridge and Iron Works, and his wife Mary Abby (Lane) Curry. They had lived at 156 Charles in 1871. They moved by 1873 and were living in Brookline by 1874. On November 1, 1872, 427 Beacon was acquired from the Sawyers by Eliza C. (Hubbard) Schumacher, the wife of John (Johannes) Schumacher, a commission merchant.. They previously had lived at 1125 Washington. During the 1876-1877 winter season, the Schumachers were living elsewhere and 427 Beacon was the home of Edgar Lombard and his wife, Katherine Welling (Butts) Lombard. He was shipping and commission merchant and warehouse owner. They previously had lived at 28 Beacon. The Lombards had moved by the 1877-1878 season and 427 Beacon was once again the Schumachers’ home. They continued to live there during the 1880-1881 season, but moved thereafter to Lexington. During the 1881-1882 winter season, 427 Beacon was the home of Dr. Herman Elvers Davidson, a physician. He was a widower. In 1880, he had lived in Washington DC. By the 1882-1883 season, he had moved to 329 Beacon. By the 1882-1883 winter season, 427 Beacon was the home of Nelson Virgil Titus and his wife, Lillie Blanche (Huckins) Titus. They previously had lived at the Commonwealth Hotel at 1697 Washington. They also maintained a home in Squantum. He was a dry goods merchant with the Jordan, Marsh & Company, and then R. H. White & Co., and then Houghton & Sutton. They continued to live at 427 Beacon during the 1884-1885 season, but moved thereafter. 427 Beacon was not listed in the 1886 Blue Book. On November 3, 1885, 427 Beacon was acquired from Eliza Schumacher by Dr. Artemus Zino Brown, a physician. He was a widower and lived in Cambridge, where he also served as assessor. He purchased 427 Beacon as an investment. Artemas Brown died in July of 1892 and 427 Beacon subsequently was owned by his estate, which continued to lease it to others. By the 1886-1887 winter season, 427 Beacon was the home of Eugene B. Abbot, a lumber dealer, and his wife, Emma (Staniford) Abbot. In 1885, they had lived at the Hotel Huntington (Huntington at Blagden). 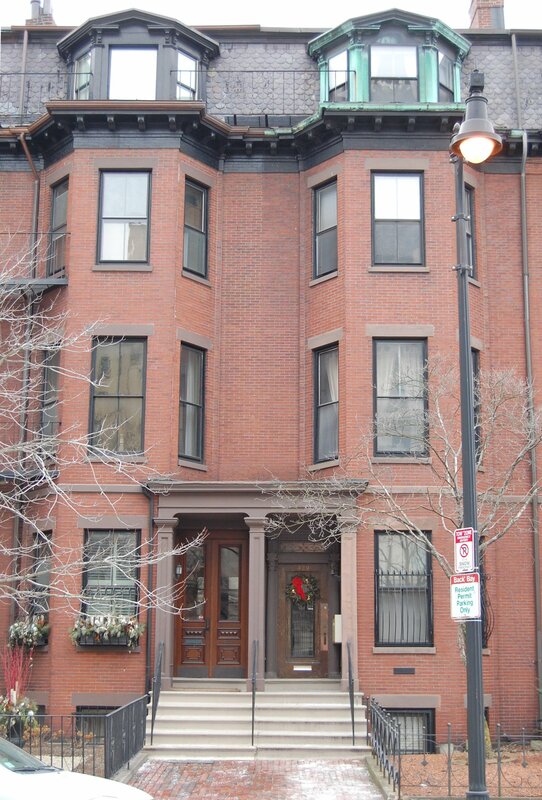 They continued to live at 427 Beacon during the 1902-1903 winter season, but had moved to 1087 Boylston by 1904. By the 1903-1904 winter season, 427 Beacon was the home of Dr. Horace David Arnold, a physician, and his wife Ida Persis (Lane) Arnold. He also maintained his medical offices there, and also sublet offices to other doctors. They previously had lived, and he had maintained his office, at 188 Warren in Roxbury. 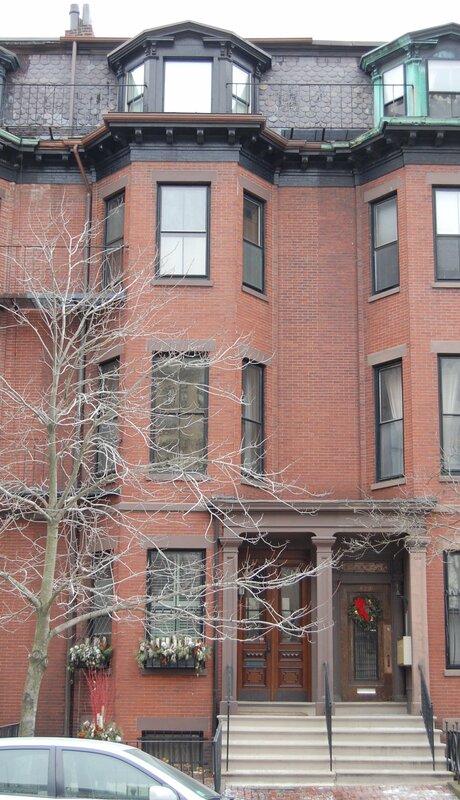 The Arnolds continued to live at 427 Beacon during the 1917-1918 season, after which they moved to Brookline. 427 Beacon was not listed in the 1919-1921 Blue Books. In the fall of 1921, through a series of transactions recorded September 15, 1921, 427 Beacon was acquired from the estate of Artemas Z. Jones by Eugenia (Muirhead) Goulding, the wife of Dr. Timothy Francis Goulding, a physician. They previously had lived at 35 Pinckney. Dr. Goulding also maintained his medical offices at 427 Beacon, and he and his wife accepted lodgers (which they also had done when they lived on Pinckney Street). By 1930, they had been joined at 427 Beacon by Eugenia Goulding’s mother, Hannah B. (Gouldrup) Muirhead (who had come from Canada in 1929). The Gouldings continued to live at 427 Beacon until about 1947. On July 3, 1947, 427 Beacon was acquired from the Gouldings by Mrs. Margaret Veronica (Norton) Gaumond, the widow of Aime Joseph Gaumond, who continued to operate it as a lodging house. She previously had lived in Cambridge. In September of 1947, she filed for (and subsequently received) permission to construct fire balconies connecting with 425 Beacon, indicating that the occupancy of the property was as a “rooming house.” She continued to live there until her death in 1953. On January 21, 1954, Donald Grimshaw and Lawrence M. Bongiovanni acquired 427 Beacon from the estate of the late Margaret V. Gaumond. They both previously had been lodgers at 425 Beacon. They continued to operate 427 Beacon as a lodging house. In the early 1960s, they converted the property into apartments. On August 8, 1979, Laura A. Shea purchased 427 Beacon from Donald Grimshaw and Lawrence M. Bongiovanni. Donald Grimshaw and Lawrence Bongiovanni continued to live at 427 Beacon in 1981, and probably later. On August 30, 1984, Ernest J. Zissis and his wifew, Birgitta Zissis, purchased 427 Beacon from Laura A. Shea. In September of 1984, Ernest Zissis filed for (and subsequently received) permission to legalize the occupancy as a single-family dwelling, noting that there was no record of the property’s legal occupancy. In response to his filing, the Building Department requested the Assessing Department to indicate how the property had been classified in its records for tax purposes, and the Assessing Department indicated that it had been assessed as a five unit apartment building. On July 16, 1992, Leslie A. Carpe, trustee of the 427 Beacon Street Realty Trust, purchased 427 Beacon from Ernest and Birgitta Zissis. On May 14, 2002, Linda J. Workman purchased 427 Beacon from Leslie A. Carpe. On January 8, 2008, John Y. Kim and Diane M. Kim, trustees of the Diane M. Kim Revocable Trust, purchased 427 Beacon from Linda Workman. The property changed hands, remaining a single-family dwelling in 2015.